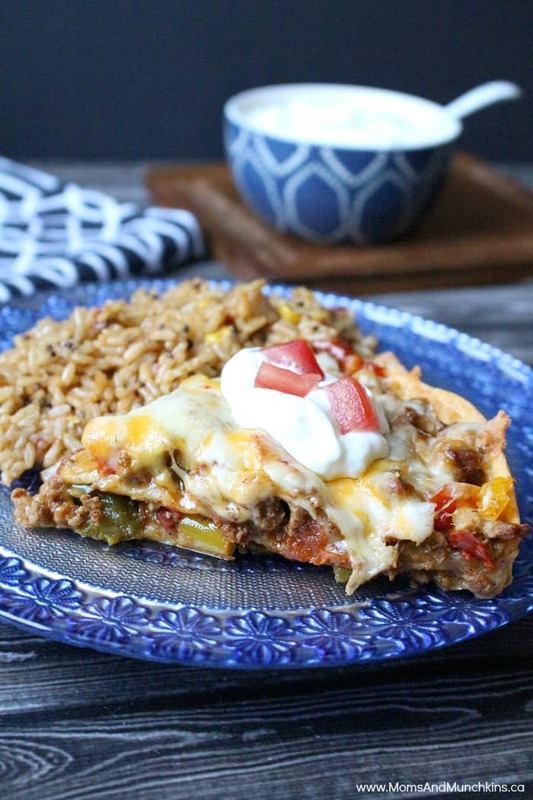 This Taco Pie recipe is so easy to make and it stores well for leftovers tomorrow. Load it up with your favourite taco toppings like bell peppers, tomatoes, jalapeños, and more for a healthier meal idea. I always sneak extra vegetables into my family meals so our meals are both delicious and healthy. 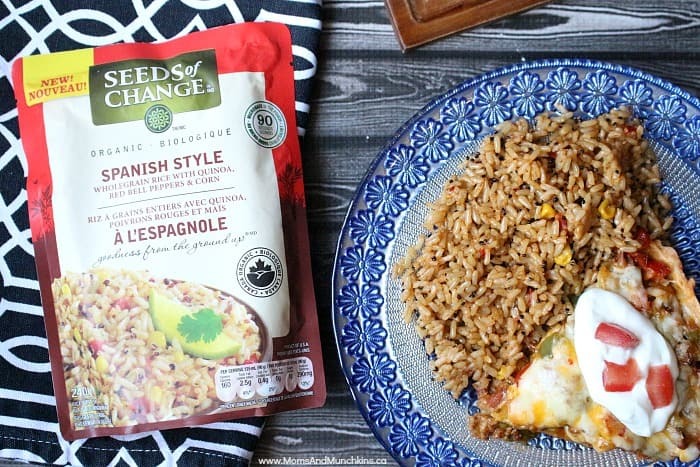 This recipe pairs perfectly with the Seeds of Change Spanish Style rice. Have you heard of the Seeds of Change products? It’s an easy & delicious way to eat organic as this healthy side dish is ready in just 90 seconds! Simply open the bag slightly, heat in the microwave for 90 seconds and it’s ready to eat. There are six Seeds of Change flavours to choose from and they are all vegetarian made with organic ingredients. Seeds of Change recently launched its Seeds of Change Grant Program in Canada, which contributes 1% of sales to community gardens across the country. Seeds of Change is helping Canadians get access to local, organic food from coast to coast with one garden in every province. 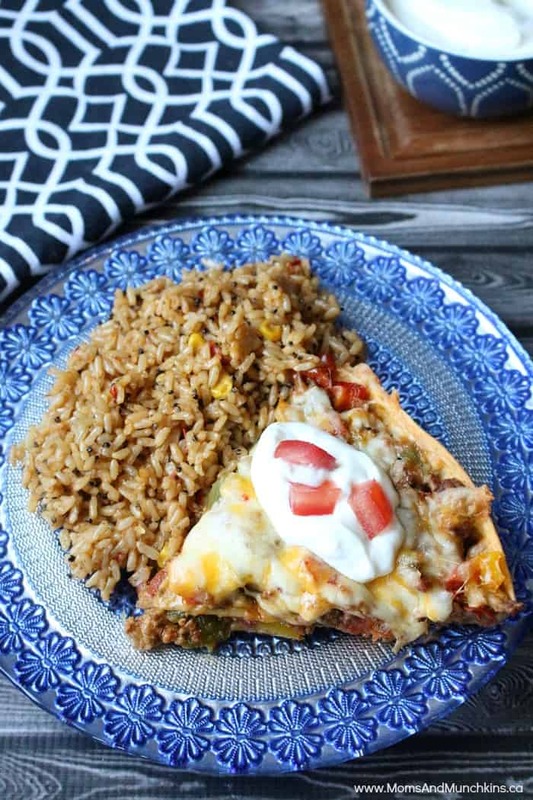 The Spanish Style I served with my taco pie has wholegrain rice with quinoa, red bell peppers and corn. I loved the flavour and I’m looking forward to trying more of their products! In this recipe, I used tomatoes and bell peppers (my favourite taco toppings) but you could add in whatever kind of vegetables you like – mushrooms, onions, or maybe even some spicy jalapeños. You could also serve this with a scoop of sour cream on top. In a large frying pan, thoroughly cook turkey until brown. Add in taco seasoning according to package directions. Add in peppers and tomatoes and simmer over medium-high heat for 10 minutes. In a 9 inch pie plate, scoop in ⅓ of the turkey and vegetable mixture. Top with one tortilla then top with another ⅓ of the turkey mixture then top with half the cheese. Add another tortilla, the remaining turkey mixture and top with the rest of the cheese. You could win one of 5 GRAND PRIZE trips for an exclusive dinner event in Prince Edward County, Ontario hosted by chef Jamie Kennedy or one of thousands of other prizes! Enter over on the Seeds of Change Facebook page. The contest ends August 14, 2016 so enter quickly! Check out our recipe page for even more tasty recipes. We’re always adding new ideas for recipes, parties and family fun. Never miss an update by following us on Facebook, Twitter, Pinterest and Instagram. *Disclosure: This is a sponsored post for SheSpeaks and SEEDS OF CHANGE.